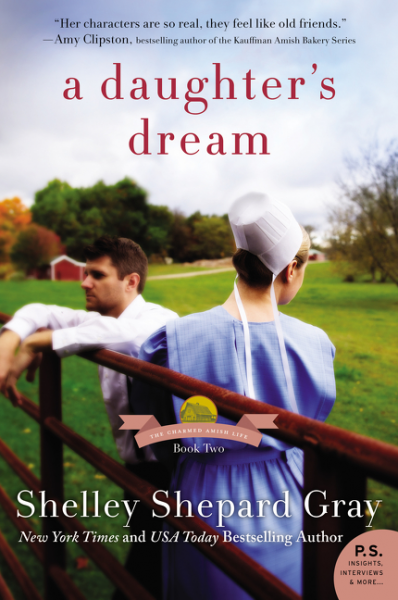 Shelley Shepard Gray has made her way into my heart as one of my favorite amish authors. I love that she continues to bring us back to the same location while expanding on the store with new character focus. 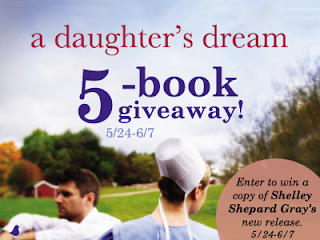 In A Daughter's Dream we focus on Kinsinger family's daughter Rebecca. She is ready to focus on her life after a hard year with the death of her dad, mill fire, brother's wedding and another brother running off. She is finally ready to move ahead and see what God has for her. I love this simple story. The characters are sweet and Gray weaves several storylines seamlessly giving you the big picture and plenty to read. This is the second book in the Charmed Amish Life Series. These stories always have God's love and presence through out the pages without being to preachy. I'm looking forward to the next installment. Rebecca Kinsinger has always dreamed of being a teacher. But when she's given the opportunity she's been waiting for at Charm Amish School, she's dismayed to discover that teaching is hard work---work she's afraid she's not very good at. That is, until Lilly Yoder joins the class. A thirteen-year old who's just lost her parents, Lilly is in need of someone like Rebecca. For the first time since starting her new job, Rebecca feels a sense of purpose. But when she meets Lilly's uncle, Jacob, his good looks and sweet, easy-going temperament are hard to ignore. How can she even entertain romantic thoughts of Jacob when his niece is her student? Suddenly becoming Lily's sole caregiver, Jacob Yoder never thought he'd be a single parent---or a farmer. Having been living in Florida as a carpenter, Jacob feels more at home wielding a hammer than a backhoe. The only bright spot in his life is Rebecca Kinsinger. As Lily and Rebecca develop a bond, Jacob's fondness for the pretty teacher grows, too. But when a fateful accident brings them together, Rebecca and Jacob must choose between duty and desire. Will they follow the path before them? Or set out to find true happiness . . . and true love? Purchase your copy at your local book retailer or online at stores like Amazon.